Hello and Happy Holidays, its Molly Hanson of Sew Wrong…Sew Right, author of Free Motion Quilting for Beginners (and those who think they can’t) and proud BERNINA ambassador, here to share with you a super quick and easy quilted Christmas stocking that you can practice your free-motion quilting on first, and then put together in just a few minutes! 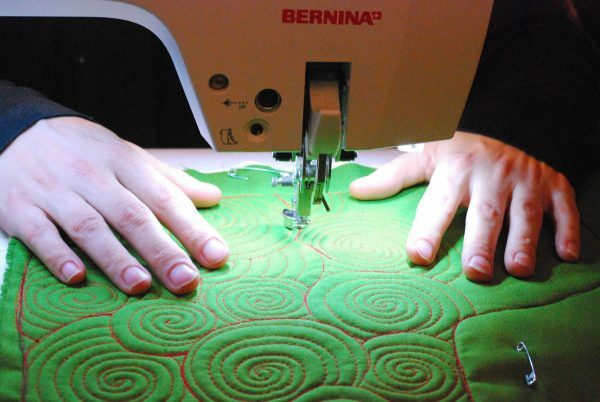 I am always looking for fun new ways to get some free-motion quilting practice and then put that practice to good use with a practical project. 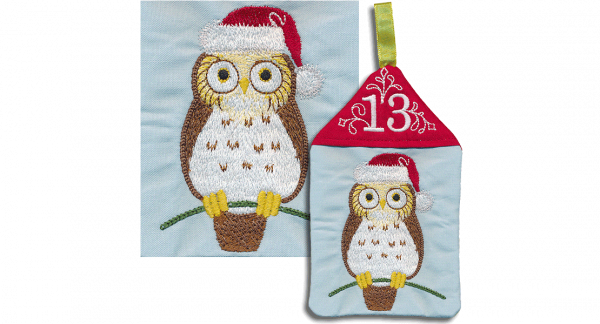 This stocking is exactly that—perfect size to practice on, with a good amount of space and endless design options—and then in just a few minutes you can turn all that pretty quilting into something worth showing off. These would make great gifts, and if you happen to have some fabric you’ve already quilted then they are perfect last minute gifts… and what quilter doesn’t need a few of those up their sleeves? If you have an old stocking to trace, a few fat quarters and some batting and a bit of trim to use at the top then you have all you need- let’s get started! Batting appropriately sized to the fabric you are using—for these stocking I used fusible fleece batting, but any batting will work. Stocking trim or fabric for binding the top edge—I purchased a yard of “fleece felt” which is felt with a fluffy side—and cut it down to 5″ wide strips (which I eventually folded in half) to use as my stocking trim—you can also purchase regular faux fur stocking trim in the trim section of any big box sewing store. You’ll need enough to go around the top of the stocking. Trace both sides of your pattern stocking onto your top layer fabric. 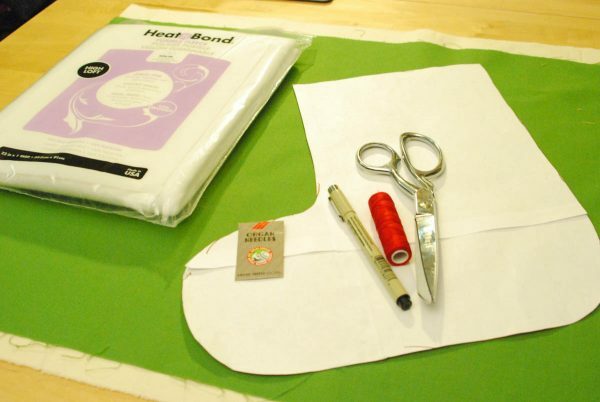 Create a quilt sandwich and quilt the inside of the quilt stockings as desired. If you need any quilting ideas or help try my book, you’ll find all the information you need to make these and several other great quilted projects, including many different stitch designs and options for how to use them. Now that the stockings are all quilted, carefully cut around your quilted stockings right next to the edge of your traced pattern. 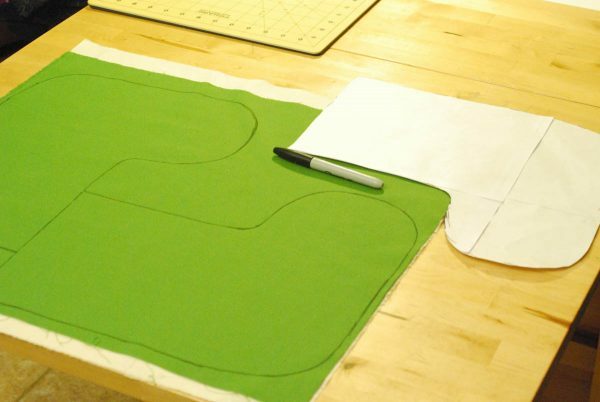 Now, with right sides of the stocking pieces facing and with a 1/4″ seam allowance, sew down from the top on one of the straight sides a few inches. Open the stocking up and pin your trim to the right side top edge. Sew trim. Once the trim is on, arrange so right sides are facing again and sew around the remaining edges of the stocking. Remember to clip your corners around the curved edges just up to the seam to make turning neater. 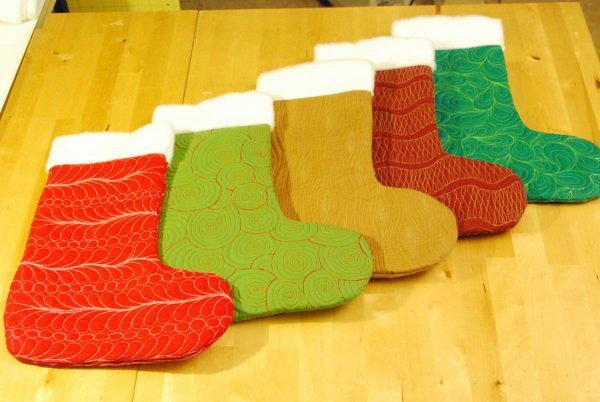 Turn inside out and Voila your stocking is all finished! You can add a hanging loop if you like. 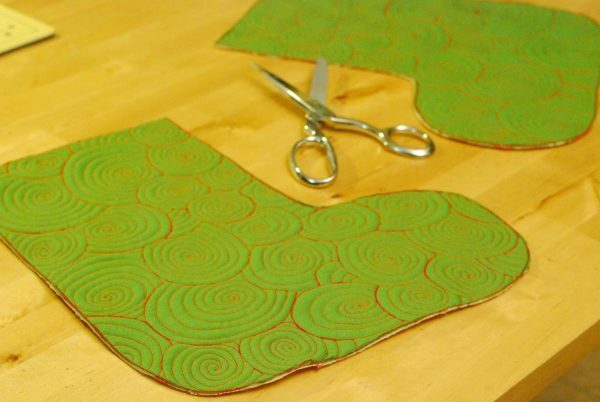 Hope you enjoyed this tutorial and have fun making quilted stockings this holiday season. Which free-motion quilting design would you choose for your quilted stocking? A winner will be chosen at random on December 14, 2015 and announced later this week! Congratulations to our WeAllSew reader “cards4u”, the winner of the December 13 gift. Enjoy! ribbon candy because it reminds me of Christmas the most! This is a great idea. I would choose a linked star free-motion quilting design for a quilted stocking. Thanks. 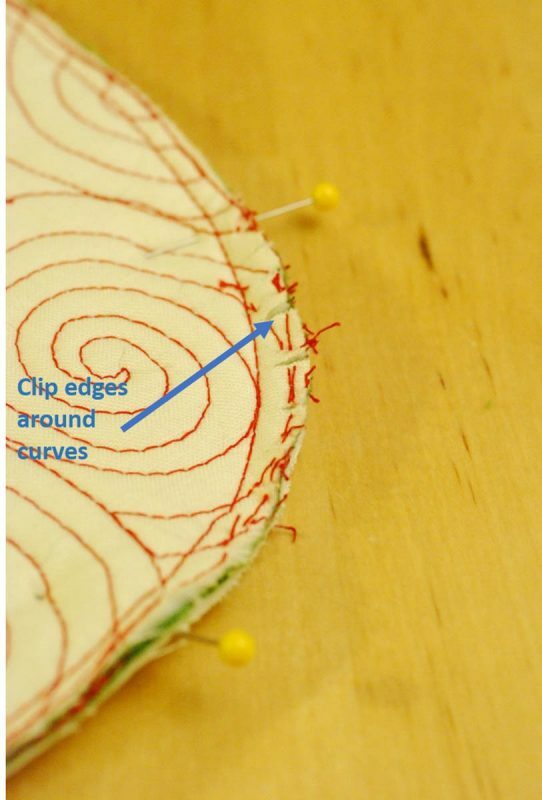 I would love to be able to just replicate this spiral technique – I’m a complete beginner so getting smooth curves is a challenge for me just yet, but I’m working on it! I think I would use a gift package design. 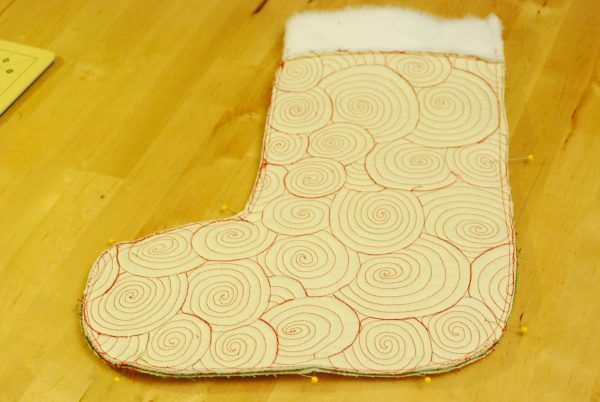 I enjoy seeing and creating random swirls and plan to try that on this stocking project. I would probably try to do something more Christmas-like. Maybe try to do ornaments or christmas trees. It looks east – but??? The spiral you are showing is wonderful. I have never tried that on a stocking so I will give it a try. I think I would use a stippling design with the name of the person the stocking is for used in the design. I would use a shell pattern to quilt my stocking. I would like to try a holly leaf pattern. I’m not sure what the designs are called but I think I would like to try the design used on the gold or cranberry stocking in the picture : ) Thanks for this fun idea! I would use a combination of loops and stars on my Christmas stocking. Thanks for the great tutorial! I would the wood grain pattern. It’s not very Christmas-like, but my husband does woodwork & would like it. I think a star pattern would be fun! I would love to try the one you did – it is time to use my 24 foot or my stitch regulator. Than you for the tutorial. I like the design that looks like loops in a row. This circle design is cool too! 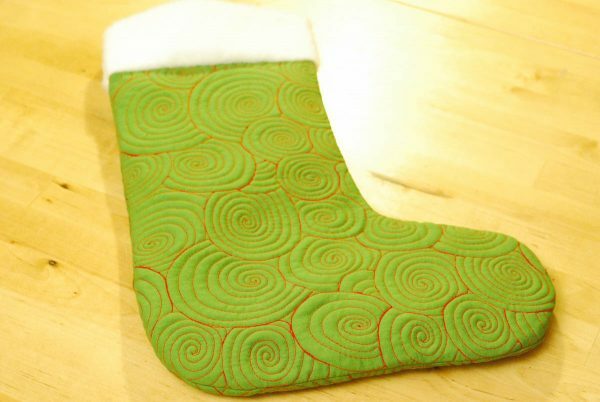 I like, and would use, the paisley-like MacTavishing FME stitch design on the stockings. I would most likely try a holly leaf design on my stockings! I would try my hand at some lines of trees and snowmen!! I’d love to try something that incorporates the snowman design we were shown the other day. I am a swirly person, love the swirls. My friend and I made these for a less fortunate family a couple of years ago. I used my Bernina to embroider each one’s name on the cuff of their stocking. Our families and friends helped fill them with age appropriate gifts and goodies. It was our gift to be able to give . ? This is all new to me. This is such a fun idea. I like the spirals shown in the tutorial. I think I would use that or some very beginning design to get started. I would like to try the free motion snowman design you showed us a few days ago. I think the paisley shape would be easy to free motion. I would choose the circular design. All the stocking designs are so cute. I would like to use the lighter red stocking free motion type design. I love the swirly design. I’m not sure which free motion quilt design I would use. I’m new to quilting. But I love a challenge. It’s to late for this year so I have a while practice to free motion to do stockings for next year. Another wonderful example with which to practice free hand quilting. I love this idea! Thank you! I would use the swirls. They add a nice touch to the stocking. I love the circles in the example, but also snowflakes might be kind of cool, also, big light bulbs like you put on the tree, with the cord being grosgrain ribbon. Thanks for the great ideas, everyone is so creative! I like the ribbon candy quilted pattern (2nd from right). I like the ribbon candy. I love Stocking #2 which you show in your post, but I sure would need to practice LOTS in order to do it. 2016 is my year to improve my FMQ. I might try the feather design that is on one of the stockings in this tutorial. 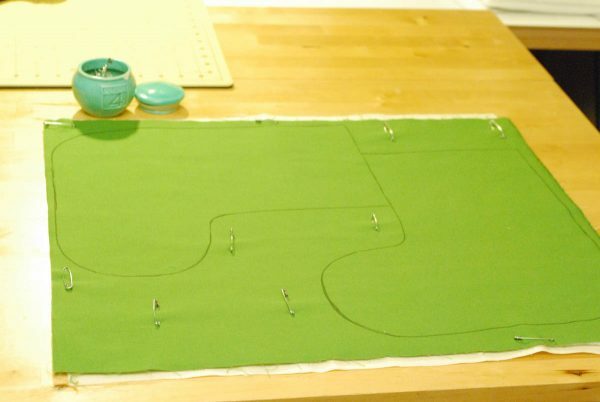 This is a great way to practice Free Motion Quilting without being overwhelmed by a super large project. I’m still working to free motion quilt. So, I would probably try random stripes and circles. I would choose Diane Gaudynski’s hairbands or Angela Walters’ mosaics. Something simple like swirls as I am not very good at free motion. Love your stocking and your circles are fantastic! I kind of like the swirls that are shown. Thanks! 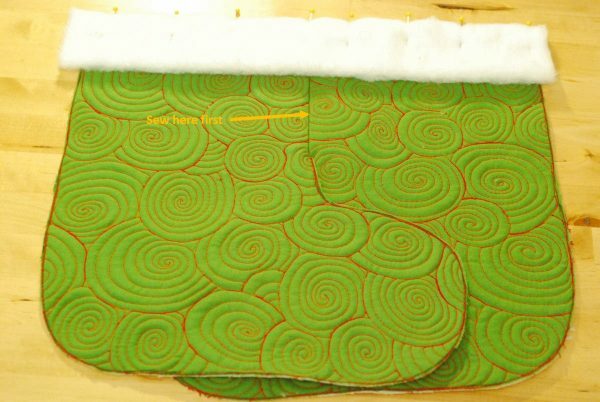 This quick stocking pattern is great for practicing free motion quilting and for gift giving. I would try the swirls. The red thread on green fabric is very inspiring. I would use MacTavishing or feathers! Love the circles! Takes practice, practice, practice, holiday music and a glass of wine! I love the swirls…great idea to practice on smaller stockings! A bit behind on this reply. I was busy making Christmas stockings! I think I’d do some seashells. I love the swirls. I am too scared to try this on my projects however. The first one in the photo looks nice. I have completed swirls fairly competently but haven’t successfully sewn the wood pattern. I really like the stocking on the far right and would like to practice it. probably because the pattern reminds me of Christmas candy. I glanced again at the stocking I would like to try and it is the red one on the right….looks like Christmas candy. A grid of straight lines. I’d like to try snowflakes but would probably start easier with spirals. I would use Icicle Lights, simple and wintery.